Are you a mountain Man? You are proud of boasting a serious stamina? You prefer calm environments under a tree shade than the office cubicle? If you meet all the criteria above, you have landed on the right place to start exploring the world around you even more. You just need to pack your bags and embark upon an adventurous journey of trekking to few of the most tranquilizing places located in remote mountains and experience the redemption all at once. Oh yes, did we tell you those wonderful treks are located in India thanks to majestic Himalayas, brilliant Karakoram range to humongous Sahyadri and timeless Nilgiri ranges down south, India has provisions for all sort of treks you can think of undertaking, arguable few of the best trekking routes in the world. Himachal Pradesh: Trekking places are aplenty in and around Kullu, Manali, Chamba, and Lahaul, with Manali serving as the base camp. The beginners in trekking can start from here as the treks are relatively easy such as the Manali - Beas kund trek is of 5 days even if you walk like you have all the time in world. A lot of people along with their families combine such easy treks with their summer holidays in. Naggar - Malana trek is a modest track of route in between conical meadows in the Kullu region. Ladakh Area: World's highest dry desert offers some cool vistas and is bordered by two of the highest mountain ranges in the world: Mighty Himalayas and grand Karakoram. 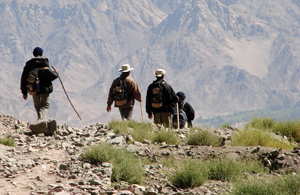 Ladakh is full of treks with all sorts, in fact it is known as the trek house of the world since every then and now, individuals as well as group has discovered altogether new trek routes since ever. Garhwal: The Garhwal Himalayas have some of the highest and mightiest peaks in the world to proffer and the treks here are considered as pro-treks given their magnitude. Though, there are some easy and modest routes for the beginners, but this region invites the excitement of the experienced the most. Popular treks are such as Har Ki Dun trek, Valley of flowers, Dodi Tal, Nanda Devi, Kalindikhal and more. The stunning Nilgiri ranges of southernmost state of India; Tamil Nadu has a pleasant weather throughout the year. Good amount of rains in this region ensure that the trekking routes here are lush green all the time. Sahyadri Range - The range which comes alive during monsoon, offers some incredible seasonal trek routes along with vistas so spectacular, that you may not miss snow and enormous peaks for a while. After being listed as UNESCO world heritage sight, Gov. of India has brought in special development plans for Western Ghats thus making it far more viable and enjoyable a place to camp or trek at. From places having historical significance to the places with breathtaking challenges, Sahyadri range certainly will leave you gobsmacked and asking for more! Want to know more about umpteen of such treks and professional assistance to help you in planning and finalizing one of them? Contact ANT Travels - reliability and nobility along with a consumer centric approach.